The workshop was aimed at building on the training offered to alumni to enable them keep up with events and issues in the industry. It was also intended to improve the capacity of journalists in writing compelling and investigative stories from the sector. The Executive Director of Penplusbytes, Kwami Ahiabenu, II said, media coverage of the extractive sector is important to ensure that mining, oil and gas sector resources and revenue are utilised for wealth creation and poverty reduction. “The media has a very important role to play in this direction and we are excited that we brought together alumni of our training program to support them to continue playing their oversight role over the extractive sector” he said. Speakers at the 3 day practical workshop included Dr. Doris Dartey of the National Media Commission who helped participants interrogate key issues that their newsrooms should look out for ahead of Ghana’s 2016 Election; Albert Kan Dapaah of FAT Africa give more insight on transparency and accountability issues surrounding oil and gas sector; Dr. Ishmael Ackah of the Africa Centre for Energy Policy elaborated on the state of oil revenue utilization in Ghana while Samuel Bekoe, Natural Resource Governance Institute (NRGI) spoke on tracking oil revenue in Ghana. These discussions were then followed by a data journalism workshop and a mentoring round table discussion, where alumni and mentors critically looked at how to improve the quality of stories on oil and gas especially in context of Ghana’s Elections 2016. In all, 16 journalists from various news media including TV3 Network, Business Today, Spy News, Ghana News Agency, the Business and Financial Times (B&FT), the Daily Graphic and the Finder Newspaper who have been trained over the years under the project were in attendance. 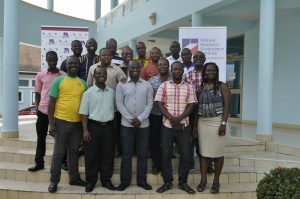 Since 2009, Penplusbytes and the Natural Resource Governance Institute (NRGI) have trained over fifty (50) Ghanaian journalists on knowledge and skills needed to effectively report about the extractive sector in Ghana under the “Strengthening Media Oversight of the Extractive Sector” project. The result of this training has been an increase of stories from the oil and gas sector in the Ghanaian media over time.